The box sat on the ground, almost overlooked in front of a row of shiny shovels. Yet it held treasures: a Bible and written prayers by the people of Connect United Methodist Church in far north Edmond. 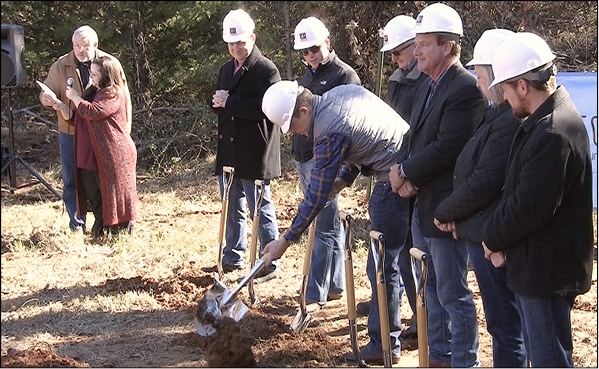 When the congregation broke ground Nov. 22 for its first building, the box was ceremoniously buried on the 8-acre property at the southeast corner of Sorghum Mill and Coltrane. "Connect UMC is built upon the foundations of prayer and the Word of God," Pastor Adam Ricks reminded those present. He prayed, "This is a big step today. The responsibility rests upon us to cause a building to rise here that shall be … devoted to the glory of the Lord Savior Jesus Christ. God, remind us every day that this is but a tool, a launching-off point from where we will do great ministry in the world." The people of the Connect community and the wider faith family have given a great deal to make the project possible, Rev. Ricks said. The building, 7,000 square feet, will feature a 220-seat sanctuary and educational space. It won’t have an office; Ricks doesn’t use one. "Nobody comes into an office asking to become a disciple of Jesus Christ," he said. Connect rocks worship at 11 a.m. on Sundays at Centennial Elementary School in Edmond until construction is complete at the site a half-mile north of the school. Projected date is October 2016. Worship attendance averages 120, the pastor said. The church reaches out in ways that have included a food truck festival, drive-in movie night, and family ice skating fun. Ricks recalled learning to make balloon animals for Connect’s booth at Edmond’s Heard on Hurd festival. Members rise to the challenge of bringing the most friends to worship. Ricks has knocked on 2,100 doors this year, he said. "It’s what I’m made for." God called him to pastoral ministry when he was age 17, at church camp, and he’s been nurtured in faith throughout his life, Ricks said. "That small voice. Once in a while you hear the call of the Lord," he said. Ricks said that Jacinda, his wife, wasn’t surprised by his calling. They’ve been together since he was age 16. She is a registered nurse. Ricks started a contemporary worship service at Ardmore-First UMC during his clergy service there. Then, appointed to Edmond-Acts 2 UMC in 2010, he was mentored in church planting by Senior Pastor Mark Foster. Connect UMC is a church plant by the Oklahoma Conference. Weekly worship began in 2012. The church’s mission is "Connect to God and Connect to Others." That outward focus has created a great deal of excitement and draws people, Ricks said. Large parts of the budget continue to be allocated to ministering to those outside of the congregation, especially the non-churched. The leadership structure is "nimble" as Connect’s participants and ministries continue to grow. Land for a church campus was purchased outright in early 2014. Now the city is improving area roads, hundreds of homes are under construction, and more schools are planned. The population of Guthrie is expanding southward, Ricks noted. Connect launched a "Gather the Tools" capital campaign that raised $480,000 for the new building. The Crossroads and Heartland Bi-District Board of Church Location and Building is providing $185,000; and the Conference’s New Faith Communities Ministry Team, $165,000, said Ricks. The people of Connect have worked to design a facility that will not jeopardize their ability to continue to reach out to others. "We don’t just want a building full of people, but a vibrant asset to the community. We plan to do everything we can to make our neighborhood and community a better place," Ricks said. On Nov. 9, Edmond City Council unanimously approved the site and building plans. That date is doubly special for the Ricks family. Daughter Clara Grace was born, joining her parents and big brother Caedmon. 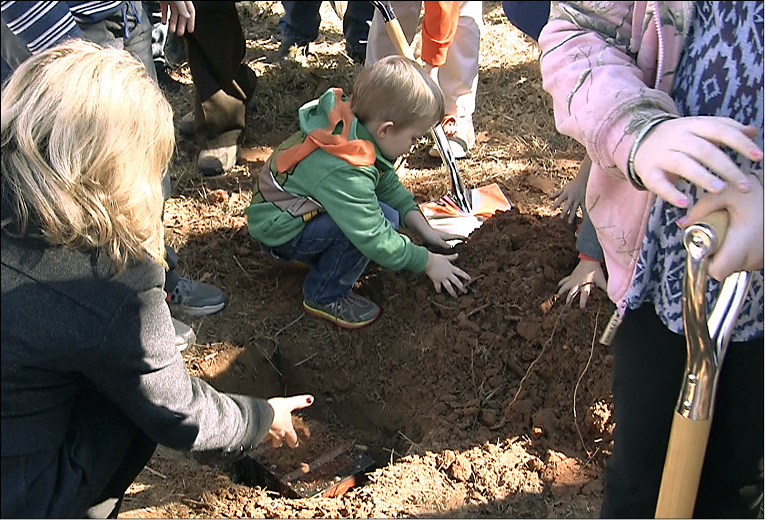 Young Caedmon Ricks helps bury a box as Connect UMC breaks ground. Shawn and Dana Kittredge, far left, lead liturgy as Connect UMC breaks ground in Edmond. Pastor and Building Committee members turn the earth; from left are Adam Ricks, Michael Largent, Ronald Cummins, Lincoln Keck, Doug McClure, Rebecca Parker, and Ryan Bader.